Georgetown’s Little Italy Finally Blooms? With the opening of a new pizza shop called Fratelli Bufala last year, GM started to notice that Georgetown had its own Little Italy forming on 31st south of M St. Along with Fratelli La Bufala there was Paper Moon and the once and future Ristorante Piccolo all on the same block. Well if you blinked you probably missed Fratelli La Bufala. It was open for only a couple months (if that.) With Ristorante Piccolo still closed and Fratelli La Bufala out, Georgetown’s Little Italy was threatening to come to an end before it even started. However, soon after Fratelli La Bufala closed, GM heard rumors that the building’s owner wanted to simply open up his own Italian restaurant. Those rumors appear to have come at least partially true. GM was walking by the store yesterday and saw some activity in the kitchen. Peering in he saw that the hostess stand had the name Il Canale written on it (which is Italian for the canal channel and/or an aphrodisiacal olive oil.) GM tipped off Carol Joynt about it and she stopped in for the scoop. The owner is Giusseppe Farrugio and this is his first restaurant in DC, although he owns several other pizza restaurants. Thus it’s likely that it will be a pizza joint (although the table settings make it look like a higher end pizza joint.) According to Carol, they’re already open although the restaurant lacks any exterior signs. As for the third amico, Ristorante Piccolo looks still weeks away from opening. So their promise to be open near the end of 2010 is starting to stretch the definition of “near” more and more by the day. Nonetheless, they should be open soon and with that, Georgetown’s Little Italy will finally be in full bloom. 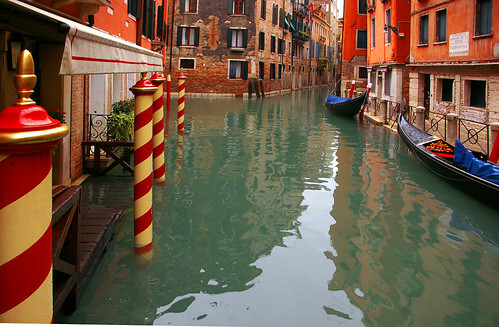 Now if we could just clean up the canal and get some gondolas, we’d really have something. You need to work on your Italian, GM. ‘Il Canale’ obviously refers to a type of olive oil common in northern Italy, known for its aphrodisiac qualities. I don’t know where you got ‘canal’ from. Actually Google Translate says it means ‘channel,’ which is kind of like a canal.